Nursing assistants in New Hampshire earned an average income of $24,000, as per the figures provided by indeed.com (as of January 2015). This average salary was 1% lower as compared to the average salaries of these employees for the job postings nationwide. The survey conducted by BLS as of May 2013, revealed that around 8,410 nursing assistants were employed in the state. Employment per 1000 jobs was 13.56. 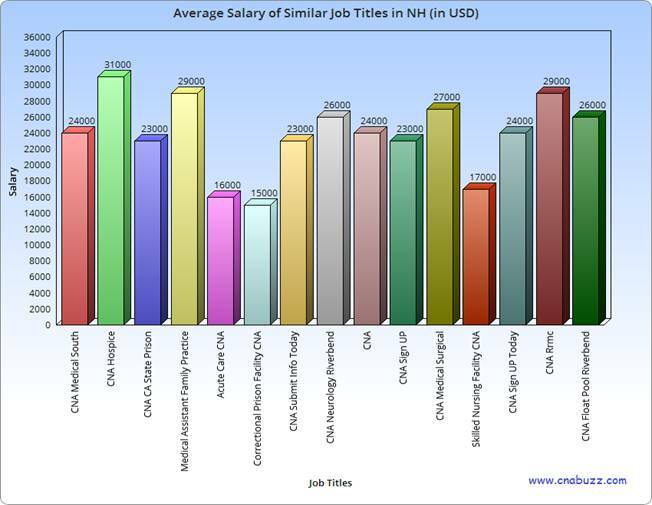 The average annual and per hour CNA salary in NH was $28,550 and 13.73 respectively. 90% of CNAs made less than $37,220; 10% made more than $37,220. 75% earned less than $32,890; remaining 25% earned more than $32,890. 50% were paid less than $28,050; rest 50% offered more than $28,050. 25% of CNAs waged less than $24,280; 75% received more than $24,280. 10% of employees were offered less than $20,960; 90% were offered more than $20,960. From the below table, we can conclude that Bedford, Concord, Derry, Manchester, Merrimack, Nashua, Salem were the highest paying cities with median annual salary of $32,456 and median monthly salary of $2,705 as on January 2015. Keene was the lowest paying city with median annual salary of $31,168 and median monthly salary of $2,597. The income of a nursing assistant primarily depends upon the responsibilities and the nature of work, which is decided as per the designation a CNA holds. In January 2015, the state offered $31,000 to the CNA Hospice, $29,000 to CNA Rrmc and Medical Assistant Family Practice. Salaries of other job titles range from $15,000 to $27,000. Although the demand for nursing assistants may be constrained to some extent since most of the nursing homes majorly rely on the funding provided by the government, but the increasing demand for home and community-based long-term care may lead to bigger opportunities for CNAs employed in community rehabilitation and home health care services. As per BLS data, the growth rate for this profession is expected to increase by 21% in the upcoming years. Question 1 – I am working as a CNA from the past 4 years in Colorado, but I’m planning to move to New Hampshire. How much annual salary can I expect in the state? Answer – A nursing assistant can expect an average income of $24,000 per annum in the state of New Hampshire. Question 2 – Suggest me some top paid CNA job titles along with their annual salary. Answer – CNA Hospice is the highest paid job title earning an annual salary of $31,000. Other top paid job titles are Medical Assistant Family Practice ($29,000), CNA Rrmc ($29,000), and CNA Medical Surgical ($27,000).